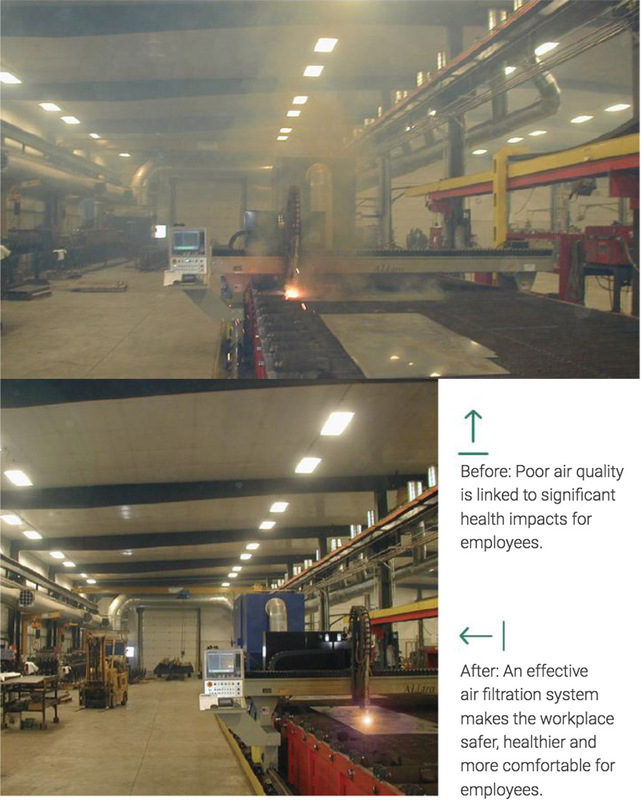 Air quality is an issue that manufacturers engaged in laser cutting and other dust-intensive processes can’t afford to ignore. While most small and mid-size manufacturers don’t have the luxury of having an industrial hygienist on staff, every facility should have someone who understands how to recognize, evaluate and mitigate common air quality problems. Fortunately, you don’t need to get a degree in industrial ventilation to get up to speed on the basics. Here are a few things every laser cutting manufacturer should know about air quality and where to go to learn the rest. Laser cutting and other kinds of metal fabrication produce dusts that are toxic and often combustible. That’s why OSHA sets regulations for the control of particulates within manufacturing facilities. There are a few different regulations that U.S. manufacturers need to be aware of when it comes to air quality. The OSHA General Duty Clause states that employers “shall furnish to each of their employees a place of employment which is free from recognized hazards that are causing or are likely to cause death or serious physical harm.” Air quality falls under this clause; employers must make sure that air is comfortable to breathe and does not create a health or safety risk for workers. OSHA CFR 1910 Subpart Z details exposure limits for most common airborne contaminants, such as hexavalent chromium, cadmium, aluminum and beryllium. Fabrication shops involved in laser cutting must keep exposures within permissible exposure limits (PELs) set for general industry. These are generally given as a ceiling (meaning concentrations cannot exceed the ceiling level at any time) or as a time weighted average calculated over an 8-hour shift. PELs are set for each potentially hazardous substance individually; manufacturers can find PELs for specific substances under Chemical Sampling Information on the Department of Labor website. 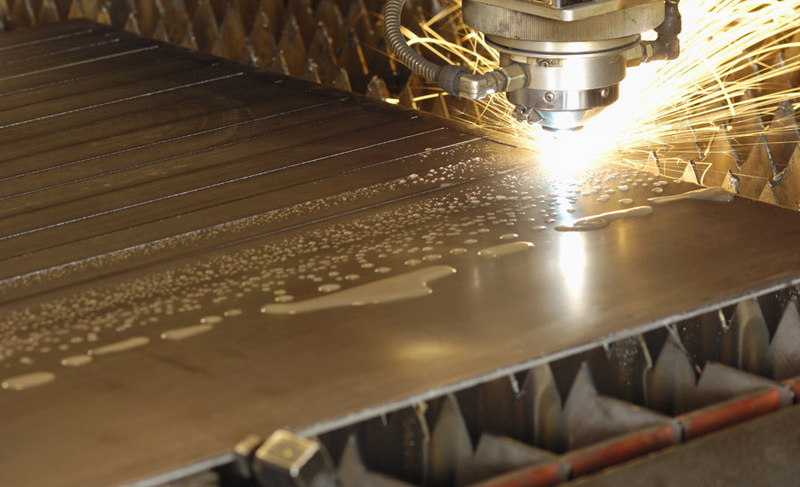 Because many airborne dusts produced by laser cutting are combustible, manufacturers should also be aware of OSHA’s regulations for combustible dusts. It’s important to ensure that dust is not able to accumulate in any enclosed area, which can lead to an explosion. Manufacturers must be prepared to document exposure levels in their facilities and the mitigation steps they have put in place to control air quality. Companies operating outside of the United States should consult regional, national and local air quality regulations. Many manufacturers are looking beyond OSHA minimum standards for better workplace safety and comfort. The National Institute for Occupational Safety and Health (NIOSH) has exposure guidelines based on scientific evidence of harm that are in many cases more stringent than OSHA requirements. The American Conference of Government Industrial Hygienists (ACGIH) has also created voluntary guidelines for exposure to toxic airborne particulates that are widely seen as best practices for industry. To ensure that your facility meets OSHA standards, you must know how to evaluate your current air quality and exposure levels. Very poor indoor air quality is likely to be visually apparent and will create an atmosphere that is unpleasant to breathe. But just because particulates aren’t creating a visible haze doesn’t mean you can rest easy. Some elements are hazardous at even low exposure levels, and fumed particulates created by thermal processes like high-speed cutting may not be apparent to the naked eye. To determine whether or not your facility is in compliance with OSHA PELs, you will need to perform an air quality evaluation. Particulate levels should be measured both at the ambient level and within the breathing zones of employees working in proximity to dust-producing processes. This is usually best done by a third party vendor; in the United States, look for one certified by the American Industrial Hygiene Association. Dust concentration meters can be used to evaluate total particulate levels in the air. Ambient air quality readings should be taken at several points throughout the facility to build an understanding of how particulates accumulate and propagate throughout the facility. Airborne dusts can be carried far away from their origin point by the natural airflow patterns within the building. Understanding these airflow patterns will help you optimize air quality system design. Personal exposure levels must be measured in the worker’s breathing zone. This is often done using wearable particulate monitors that measure exposure over an 8-hour shift. Understanding total particulate levels is just the first step. Manufacturers must also know the concentration levels of regulated hazardous substances in the particulates. For laser cutting, this will depend on the base material and any coatings or metalworking fluids that may be present. Some of the most dangerous include hexavalent chromium (created when cutting stainless steel), cadmium, chromium, aluminum, lead, nickel, manganese and beryllium. If your processes and materials are well understood, you may be able to estimate exposure levels for specific substances based on the total particulate levels. To get a clearer picture, dust collected during evaluation can be sent to a lab for chemical analysis. Enclosing lasers makes dust easier to collect and reduces the CFM requirements for the dust collector. Laser cutting dust contains many hazardous substances that can lead to acute and chronic health effects. All dust can be irritating to the lungs and the mucus membranes found in the eyes, nose and throat. Exposure to heavy particulate levels, even if otherwise nontoxic, can cause coughing, eye irritation and sore throat. When the substances are toxic, acute and chronic effects are more serious. Acute exposure to thermal metalworking dusts can lead to a condition known as “metal fume fever,” which can mimic the flu with fever, chills, nausea, muscle aches, joint pain, sore throat, coughing and shortness of breath. Long-term exposure to metal dusts can lead to chronic conditions including neurological symptoms that mimic Parkinson’s disease or multiple sclerosis, asthma and other chronic respiratory problems, kidney damage or cancer. All employees should understand the health hazards of the specific substances they are working with and know how to recognize acute and chronic exposure effects. Employees showing symptoms of metal fume fever or respiratory distress should be immediately evaluated by a doctor. Because many effects of toxic exposure can be missed or mistaken for other medical problems, it is very important to give healthcare workers accurate information about what the worker may have been exposed to, the approximate exposure level (if known) and the length of time of exposure. Employers should also track incidents of chronic health problems – including asthma, other respiratory issues, certain cancers and neurological problems – that could indicate a chronic exposure problem in the facility. OSHA requires employers working with some toxic substances to have a formal medical surveillance program in place and provide worker education about the health risks they may be exposed to. Knowing the basics of air quality system design can help manufacturers save money and make better choices for their facilities. 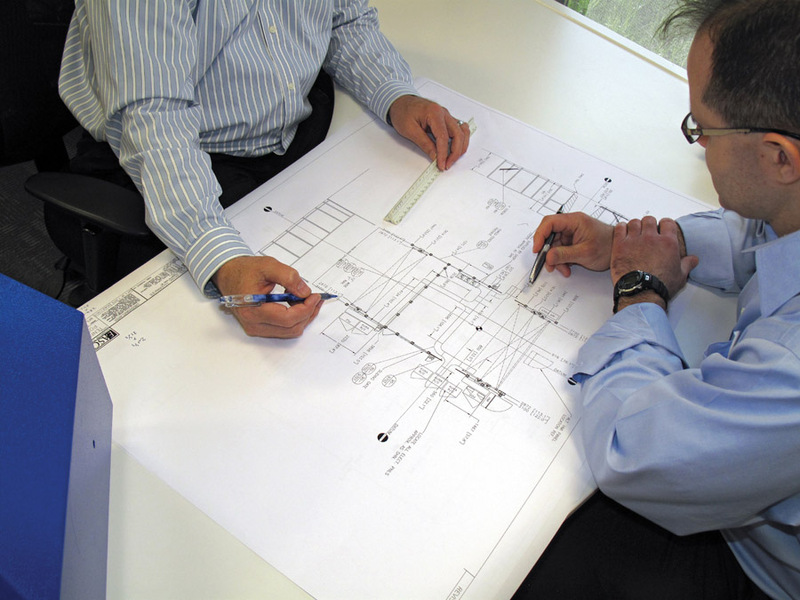 Industrial ventilation or filtration system design can be complex, and most companies will want to consult an expert when selecting and installing air quality equipment. But there are a few basic concepts that manufacturers should understand. Wherever possible, laser cutting equipment should be enclosed to prevent dust from escaping into the ambient air. Source capture is much more efficient and cost effective than cleaning air for the entire facility. Dust collectors can be connected directly to laser enclosures or several machines can be connected to a larger centralized system. If machines cannot be fully enclosed, steps should be taken to isolate the production area from the rest of the facility for easier dust collection. In some cases, a backup ventilation or ambient air filtration system may be necessary to remove residual particulates from the ambient air. Air filtration is generally more energy efficient than simple “exhaust and makeup air” ventilation. Filtration systems return cleaned air back to the facility, keeping indoor-temperature air in and reducing stress on the HVAC system. It’s important to make sure that your dust collector is properly sized for the volume of fumes you produce and the volume of air that must be turned over. A dust collector that does not have high enough blower speed (measured in cubic feet of air per minute, or CFM) will not be able to keep up with the dust you produce. If you do not have enough filter media, your filters will become clogged too rapidly, leading to higher energy and consumable costs and excess wear and tear on the machine. If your dusts are combustible, look for dust collection systems that have explosion safety features built in, including explosion vents, isolation valves and airlocks. An air quality system designer can help you to evaluate your needs based on the type and volume of dust you produce, the layout of your facility and production lines, and your ultimate air quality goals. The OSHA, NIOSH and ACGIH websites are a great resource for additional information about air quality regulations, hazards and mitigation options. If you don’t already have someone with industrial hygiene expertise on staff, you may want to consider additional education for yourself or a staff member. Many universities and local community colleges offer short courses on industrial hygiene and/or industrial ventilation. RoboVent offers a two-day Clean Air Academy that covers the basics in regulation, health and safety issues and air quality system design for plan managers, engineers and maintenance staff. Understanding the basics of clean air will help plant managers and other manufacturing leaders recognize potential health and safety hazards and make better decisions for air quality control. The more you know, the better you can protect your employees, your facility and your bottom line.